Home Uncategorized December 2015 Word UP event. Hey, everybody! Word Up’s next event is on Thursday December 10, 2015 @ Unity Market Cafe & Studios. We’ll start at the usual 7 pm time and feature one guest reader followed by the ever-popular open mic. Robert L. Ballantyne will read from his new novel, Pharaohs of the Sky. He’s an author from Innisfil. His tale begins in the streets of Toronto and take us to a secretive Washington book shop, to the heart of Cairo to the peaks of the great pyramids. 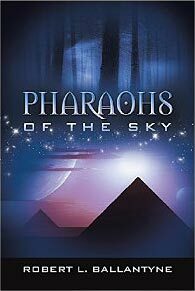 Pharaohs of the Sky lures you into a world where nothing is as it seems, and where clandestine operatives conspire to hide the truth. In this international mystery, fact remains elusive by design and fate alike, yet all revolves around the answer to one question: Are we really alone? Check out his book here at Amazon. Click here. Find it here at iUniverse. Click here.